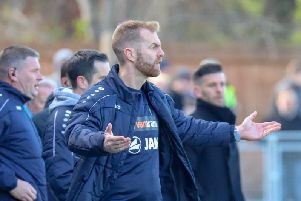 Michael Woods has only fond memories of his time at Hartlepool United and speaks in glowing terms about the club’s supporters. That said, he is determined to “get one over” on his former employers when they visit Wetherby Road this Saturday. “There’s nothing I’d like more than three points against Hartlepool,” he told the Harrogate Advertiser. “I had a great time there and met some really great people. Their supporters are a good bunch and a group of them even brought a crate of beer to the hospital I was in after breaking my leg a few years ago, however I’m a Harrogate Town player now and all that matters is that we get a result on Saturday. “Obviously when you play against your old team in the same season that you’ve transferred it adds a bit of needle and I’ve already had a few messages from some of the Hartlepool lads, but I’m really looking forward to the game. Despite having been chosen for live television coverage by BT Sport, the game is a sell-out with Hartlepool having shifted their allocation of 825 tickets. And those visiting supporters will definitely help create a special atmosphere inside the CNG Stadium, according to Woods. “The Hartlepool fans always impressed me, they follow the team in great numbers away from home considering the distances they have to travel up and down the country from where they are in the north east. “They’ll make a lot of noise on Saturday and that will only add to the atmosphere, but we’re at home and it’s up to us to impose ourselves and our style of play on the game and set the tempo. Neither side head into the fixture in great form, though Town ended a run of five matches without a win when they beat Dover Athletic in the FA Trophy last time out. “It’s a big game for both clubs. We both need the points at the moment, however we’re confident after beating Dover,” Woods added.